Mohamed Ben-Daya is a Professor in the Department of Systems Engineering at King Fahd University of Petroleum and Minerals, Dhahran, Saudi Arabia. He received his PhD in Operations Research from Georgia Institute of Technology, USA. His research interests are in the areas of production planning and scheduling, maintenance, quality control, supply chain management, and risk management in product development. He teaches course in the areas of facilities planning, Production and inventory control, scheduling, Quality control, Maintenance and reliability engineering and supply chain management. 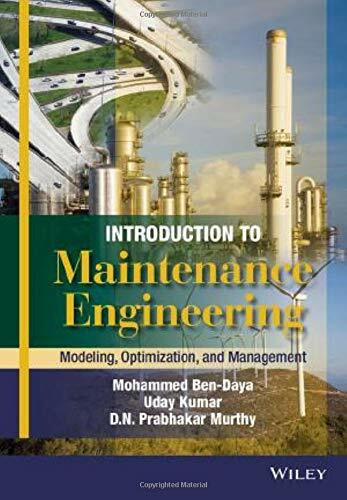 Dr. Ben-Daya is the Associate Editor of the Journal of Quality in Maintenance Engineering and on the Editorial Board of the Journal of Logistics. He has published over eighty papers in refereed journals and conference proceedings and co-edited five books. Pra Murthy obtained B.E. and M.E. degrees from Jabalpur University and the Indian Institute of Science in India and M.S. and Ph.D. degrees from Harvard University. At The University of Queensland he was responsible for setting up the Technology Management Centre (offering master's program in technology management) and Reliability Engineering and Risk Management Group (offering postgraduate programs in reliability and maintenance). He has held visiting appointments at fifteen universities in the USA, Europe and Asia. His current research interests include various aspects of reliability, maintenance, warranties and service contracts. He has authored or co-authored 20 book chapters, 165 journal papers and 150 conference papers. He is a co-author of 7, and co-editor of 3, books. He has run short courses for industry on various topics in technology management, operations management and post-sale support in Australia, Asia, Europe and the USA. Uday Kumar obtained his B. Tech from IIT BHU, India and worked 7 years in industry before joining the postgraduate program of Lulea University of Technology, Lulea, Sweden to obtain a PhD degree in field of Reliability and Maintenance Engineering during 1990. He worked as a Senior Lecturer and Associate Professor at Lulea University and joined University of Stavanger, Norway as a Professor of Mechanical Engineering (Maintenance) in 1997. In July 2001, he was appointed as a Professor of Operation and Maintenance Engineering at Lulea University of Technology, Lulea, Sweden. He has been guest faculty at Helsinki University of Technology, Helsinki, Imperial College London and Stavanger University, University of Tromso, Norway, University of Cincinnati, USA. His research interests are equipment maintenance, reliability and maintainability analysis, etc. He has published more than 275 papers in International Journals and Conference Proceedings.